William "Billy" Tucci is an illustrator, writer and filmmaker best known among American comic book audiences for his creator-owned title and character Shi. 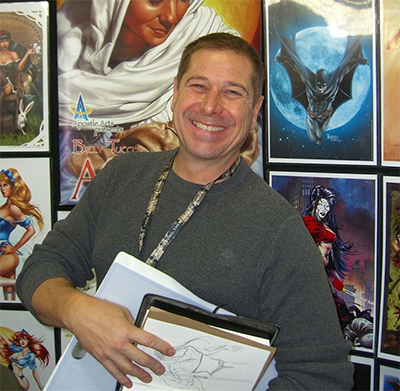 Tucci has also worked with Marvel, DC, Apostle Arts, and founded Crusade Fine Arts in 1994. Tucci is very active in raising awareness, honoring, and remembering veterans. Crusade was founded by Billy Tucci in a one bedroom apartment in Queens, New York, through which he publishes both his personal projects, as well as work from other up and coming creators. Crusade Comics' flagship title, Shi, has sold over four million comic books and grossed over $25 million in sales since debuting in March 1994. Several comic characters, including Top Cow’s Witchblade and David Mack’s Kabuki, actually debuted in Shi. Shi has been featured on Fox, NBC, and E! television while also gaining recognition in The New York Times, Wall Street Journal, and USA Today. The character has also crossed over with many comic book icons including Daredevil, Witchblade, Vampirella and Wolverine. For more than two years Shi: The Way of the Warrior number one remained atop Wizard Magazine's top ten comics list, a record for any single issue that still stands. He is also one of the few comic book creators recognized by Wizard. Tucci is presently writing and illustrating Shi - Return of the Warrior and writing Zombie-Sama! a comedy graphic novel with illustrator John Broglia both published by Crusade Fine Arts. In 2006 Tucci began doing work for the "big two" in the American comic book industry, pencilling Marvel Comics' Heroes for Hire, and DC's VS cards. He also released the 576 page Definitive Shi, the Illustrated Warrior. In 2007, on Shi also had a crossover with Brian Pulido's Lady Death/Shi through Avatar Press and with Peter David's Fallen Angel through IDW Publishing. Dark Horse Comics is also producing a 200-page hardbound Art of Shi coffee table book showcasing several artists' take on the character. Other Shi projects include a full color Zombie-sama! with John Broglia and Definitive Shi Vol. 2. Tucci produced a six-part miniseries for DC, Sgt. Rock: The Lost Battalion, which premiered November 2008. The final part was released in June 2009. Describing the series, as a "labor of love", Tucci spent time at a large reenactment with over 2,000 World War II reenactors in Pennsylvania as part of his research for the story. In the reenactment, Tuccci acted out the part of a war correspondent, interviewed several veterans of the campaign, and visited the grounds where battles took place. On March 4th, 2008 Monsieur Michel Langloix, Vice-President du Conseil General des Vosges bestowed the honor of Ambassador to William Tucci in the ancient town of Bruyeres. The decree reads, “William Tucci, Ambassadeur, De La Region De Bruyeres, Vosges, France.” The Lost Battalion received the 2011 Gold Medal in the Fiction-Thriller category from the Military Writers Society of America (MWSA). Since then he has worked on several titles including Jonah Hex, Birds of Prey, Flash Vs. Superman, and Harley Quinn among dozens of covers. In 2011, Tucci's Batman - A Trick For The Scarecrow was nominated for the Eisner Award for Best Short Story. As partner of Apostle Arts LLC, Tucci created Billy Tucci's a Child is Born, a 32 page graphic novella for Christmas 2011. Adapted from the Gospels of Matthew and Luke, and painstakingly researched with Nativity scholars, A Child Is Born brings forth a stunning rendition of the events surrounding the birth of Jesus Christ. Awarded five Doves by The Dove Foundation, nominated for six Comics Buyer’s Guide Awards, and the hardcover "Gift Edition" won the 2013 Christian Small Publisher Book of the Year Award. Tucci wrote, produced and directed a short film, some trouble of a SeRRious nature. In 2017, Shi the motion picture was optioned by Producer Mimi Polk Gitliin with Tucci serving as executive producer.